The subtle awfulness of the McCutcheon v. FEC campaign finance decision: The John Roberts two-step. The Supreme Court takes a big step closer to gutting the last bits of campaign finance reform. John Roberts two-steps on campaign contribution limits. Back when Justice Elena Kagan was Solicitor General Kagan, she argued to the Supreme Court in favor of the ban on corporate spending in the Citizens United case. She offered the justices all kinds of ways for the court to decide that case in favor of the nonprofit corporation, short of overturning the ban itself. When questioned by Chief Justice John Roberts about whether she was asking for the government to lose in a certain way, Kagan responded: “If you are asking me, Mr. Chief Justice, as to whether the government has a preference as to the way in which it loses, if it has to lose, the answer is yes.” Today, once again, the government lost a campaign finance case, McCutcheon v. FEC. And while it could have lost in somewhat worse ways, this opinion is pretty awful, portending a raft of new First Amendment attacks on soft money and even on the basic rules limiting how much individuals can give candidates for office. As I explained back in September in Slate, at issue in McCutcheon was “aggregate” campaign finance limits in federal elections. Federal law currently caps at $48,600 the total amount an individual can give to all federal candidates for office during any one two-year election cycle. It also limits to $74,600 the total amount an individual can give to political committees that make contributions to candidates and sets a total cap of $123,200 for contributions in the two-year cycle. This law was challenged by someone who wanted to give a series of $1,776 contributions to more congressional candidates than he was allowed, and the Republican National Committee, which wanted to accept more than it was allowed to take under this legal regime. It seemed pretty clear after oral argument that the government was going to lose—the five conservative Justices on the court have not voted to uphold a campaign finance limit since Justice Samuel Alito joined the court—but the question was how the government was going to lose. Of all the conservative jurists, Chief Justice John Roberts was hardest to pin down after argument, and he expressed some sympathy at the time with the government’s argument that if the aggregate limits fell, it would provide an opportunity for individuals to give multimillion-dollar checks to elected officials, parties, and political committees to be divvied up through sophisticated campaign finance entities. It even appeared that Roberts might vote to uphold some aggregate limits and strike down others. But in today’s opinion, that hesitation and that potential to take a middle road evaporated. Instead we have vintage Roberts playing the long game. The tone is one of minimalism and moderation: We are only striking down aggregate limits, not the base limits, which currently prevent individuals from giving more than $2,600 per election to federal candidates. There are lots of things Congress can try to enact (though Roberts knows it won’t) in order to prevent the rise of these transfers and candidate fundraising committees. We don’t need to revisit the distinction the Supreme Court made in the 1976 case of Buckley v. Valeo, in which the court held that contribution limits are subject to less searching judicial review than spending limits. But this is nevertheless a subtly awful decision. It is true that Roberts sidestepped today the question of whether to apply “strict scrutiny” of contribution limits in another case; he did not need to take that dramatic (and high-profile) step to do a whole lot of damage to campaign finance law. Instead, he did three things which now set the course toward even more campaign finance challenges under the First Amendment and more deregulation. First, as I feared, he has incorporated the very stingy definition of corruption used in Citizens United spending limit cases into the contribution area. This matters because the court has recognized only the interest in preventing corruption and the appearance of corruption as a permissible reason for upholding campaign finance limits. (Equality, for example, is a forbidden interest under the First Amendment.) By requiring that any campaign finance laws be deemed necessary to prevent quid pro quo corruption, akin to bribery, many more campaign laws could fall in the near future, including those base $2,600 limits. While Roberts goes out of his way to say that those base limits were not challenged today, he does not do anything to affirm that those limits are safe. In fact, he expressly says those limits don’t prevent corruption, but are “prophylaxis”—and that itself could provide a basis for striking them down. Second, Roberts makes that laxer level of scrutiny applicable to review of contribution limits somewhat stricter. Buckley established that contribution limits get judged under something called “exacting scrutiny,” which in practice in the past has led the court to uphold a large number of contribution limits based upon very little evidence of corruption. Today Roberts tightens that standard, requiring more evidence (to be judged against the new strict “corruption” definition). He had no need, then, to adopt “strict scrutiny” for contribution limits. Why write an opinion that dramatically adopts strict scrutiny when one can accomplish nearly the same thing by quietly changing the meaning of the “exacting scrutiny,” which applies to contribution limits? 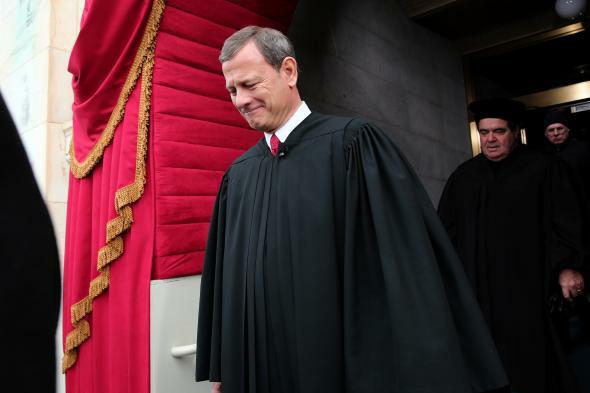 Roberts didn’t have a five-justice majority for his opinion. That’s because Justice Clarence Thomas would have gone even further, subjecting everything to do with campaign finance regulation to strict scrutiny and striking it all down. It’s only in that sense that Roberts appears to be a moderate today. Justice Stephen Breyer, for the four liberals on the court, is not fooled by Roberts’ supposed restraint. We shouldn’t be either. This opinion promises more bad things to come for money in politics, and soon.